Founded ten years ago, since its inception My Home Life has gone on to work tirelessly for the care home sector and its aim of creating a world where all care homes for older people are great places to live, die, visit and work. Initiated in 2006 by National Care Forum and Help the Aged, in the first phase of My Home Life Julienne Meyer CBE, Professor of Nursing: Care for Older People at City, University of London was commissioned to review the literature on quality of life in care homes. This was done in partnership with the National Care Homes Research and Development Forum, an academic resource which continues to be linked to My Home Life today. Ten years on from its creation, My Home Life continues to go from strength to strength. It has spread across the UK, with linked initiatives hosted by Ulster University, University of West of Scotland and Age Cymru in Wales and it is now being adopted in Australia. 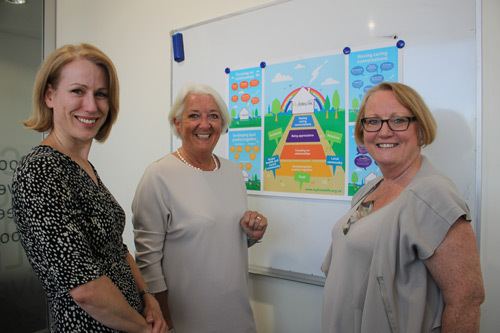 As part of the recent visit to Australia at the invitation of SA Innovation Hub, Professor Meyer (Director MHL England) was joined by Professor Belinda Dewar (Director of MHL Scotland) to prepare facilitators to spread the MHL ways of working there. The SA Innovation Hub is a community of practice in action which translates ideas, innovation, learning and research into practice. SA Innovation Hub originally contacted MHL due to the parallels between the ambition of the Hub and the MHL vision. Currently MHL connects people through four evidence-based conceptual frameworks, which highlight the importance of developing best practice together, focusing on relationships, being appreciative and having caring conversations. These have obvious global implications. Professors Dewar and Meyer were also accompanied to Australia by Caroline Emmer De Albuquerque Green, who is a PhD student at King’s College London exploring human rights in care homes and the CEO of a Foundation who are also interested in taking forward My Home Life in Germany.